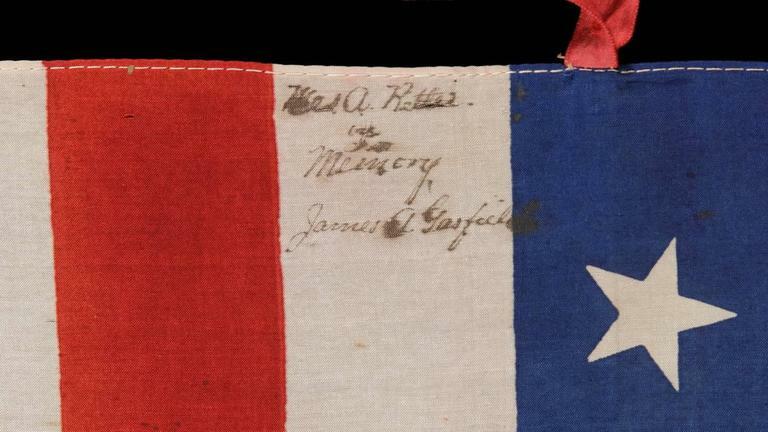 48 Stars on a Small-Scale Flag , Signed "Storm King"
37 STARS ON A LARGE SCALE SILK PARADE FLAG WITH HAND-INSCRIBED MOURNING NOTATION REGARDING THE 1880 DEATH OF PRESIDENT JAMES GARFIELD AND ITS STARS ARRANGED IN A "DANCING" OR "TUMBLING" ORIENTATION, NEBRASKA STATEHOOD, 1867-1876, THE ERA OF AMERICAN RECONSTRUCTION: 37 star American national parade flag, printed on silk, bound along the hoist and fly ends with treadle stitching. The stars are configured in justified lineal rows of 6-6-6-7-6-6 and are oriented such that they alternate point-up, point-down consecutively throughout the field so that they are what I have termed dancing or tumbling. One might expect that this layout, with an extra star squeezed into in the 4th row, may have progressed from a previous arrangement of 36 stars in columns that alternated with stars point-up, point-down from one to the next across the canton, but I have never encountered a 36 star parade flag in that design in any format, size, or fabric. Silk was the finest and most expensive fabric used in flag-making and the colors were often stunning. That is no exception here. Note the particularly vibrant shades of scarlet red and royal blue, which are especially striking. Also notable are the red ties along the hoist, made of silk ribbon. These were used to affix the flag to a staff, while most parade flags, by contrast, were tacked or glued. The ties add a nice visual feature to the presentation. Of further interest is the flag's size. Because most parade flags were 3 feet long or smaller on the fly, this particular example is notably large in scale. 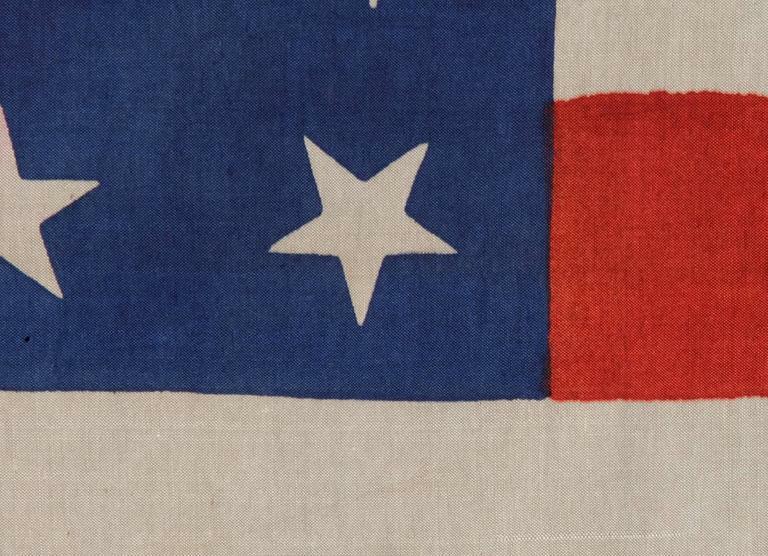 The flag's most interesting feature, however, can be found in the 4th white stripe, adjacent to the hoist, where the following text was inscribed with a dip pen: "Mrs. [possibly "Mes."] A. Rettes; In Memory; James A. Garfield." 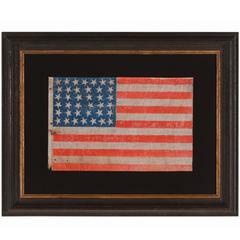 Flags with hand-written messages that have American cultural significance, and/or express patriotic sentiments, are generally of great interest to collectors. 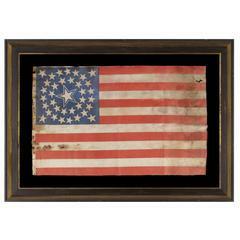 Events related to the lives of American presidents have particular appeal and cross categories between flags and political memorabilia. Although the identity of Rettes is unknown, I do recall when this flag was discovered, about 12-15 years ago. It came out in a rural region along the northern border of Pennsylvania, and was sold to a local collector and dealer. It changed hands several times afterwards and I was eventually able to acquire it. The 37th state, Nebraska, joined the Union on March 1st, 1867. The 37 star flag was official from that year until 1877, although it generally fell from use in 1875 or 1876 with the impending addition of more states. The 37 star-count is quite scarce in comparison to the flags that immediately preceded and followed it. This is due primarily to the lack of major patriotic events during the period they were used, which followed the Civil War, yet preceded the 1876 anniversary of American independence and encompassed most of Southern Reconstruction. While the 37 star flag was still official in 1876, it was well known that at least one more state would be joining the Union that year. This caused flag makers to cease production in favor of 38 and 39 star flags. 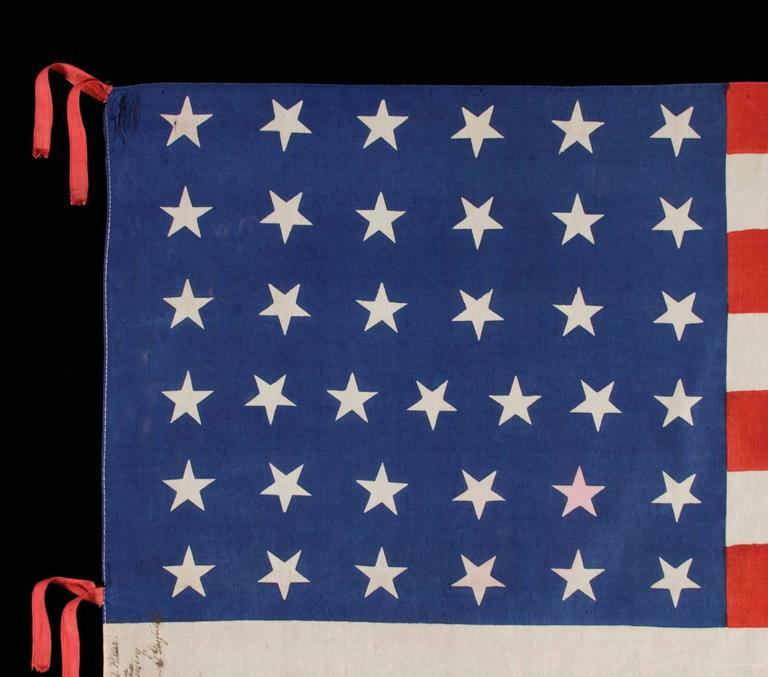 It was for this reason that 37 star parade flags were seldom produced for the Centennial International Exposition, where 38, 39 and 13 star counts (the latter to commemorate the 13 original colonies) were far more prevalent. Brief History of Garfield and Arthur: James Abraham Garfield was a professor who left academics for law before his 1859 election to the Ohio State Senate. Like his Democrat opponent, Winfield Scott Hancock, Garfield served as a Union Army General during wartime. Though successful would be an accurate description of Garfield’s military career, it was brief and unlike that of the much-celebrated Hancock. Garfield left the Army during wartime, in 1863, when he was elected to the United States Congress. His promotion to major general came after the Battle of Chickamauga, shortly after he had been elected. In 1876 he moved to the Senate and became the Republican floor leader. In that same year he was appointed to the highly controversial Electoral Commission that put Rutherford B. Hayes in the White House despite his loss of the popular vote. In 1880 he ran for president and won, though he served less than four months in office. He became the second U.S. president to be assassinated when he was shot by Charles J. Guiteau on July 2nd, 1881, a disgruntled man who unsuccessfully pursued a political appointment following the election. Garfield lived until September 19th, when he died as a result of his wounds. Chester Arthur succeeded to the presidency and served out the remainder of the term. Like many Vice Presidents, Arthur was chosen for political advantage, to placate his faction, rather than for skills or loyalty to his running mate. He is an interesting figure in political history for several reasons, among them the rather shocking fact that he may not have been a U.S. Citizen. Arthur’s parents were Irish immigrants to Canada and lived just 80 miles from the Vermont border before moving to the U.S.. Arthur claimed to have been born in 1829 in the town of Fairfield, Vermont, though no birth record has ever been found and he artfully avoided the question of his possible birth on Canadian soil. On at least one occasion he reported the date of his birth as 1830 instead of 1829, and there seems ample reason to be suspect of the information he provided. Arthur was a member of the Stalwarts of the Republican Party, a faction the opposed Civil Service reform and was less moderate than the politics of the supporters of Rutherford B. Hayes. Before Charles Guiteau surrendered to authorities he shouted: “I am a Stalwart of the Stalwarts...Arthur is president now!”, which resulted in no lack of further controversy and questioning. As a result, Arthur laid low after the shooting, retiring to his home in New York. He rarely appeared publicly and effectively left the nation fumbling, without a leader, until Garfield’s passing. Mounting: The flag has been hand-stitched to 100% cotton, black in color, which was washed to reduce excess dye. An acid-free agent was added to the wash to further set the dye and the fabric was heat-treated for the same purpose. The flag has not yet been framed, but framing in one of our best moldings is included. 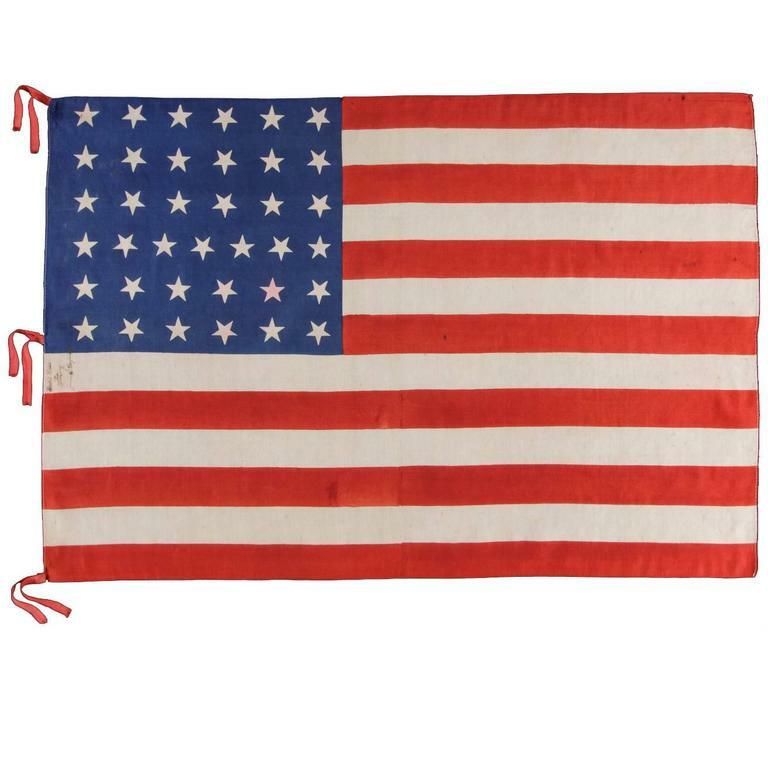 Condition: There is minor fabric breakdown at the top and bottom corners of the fly end, where the flag received the greatest amount of stress when flown. There are also a couple of tiny holes and nicks occurring in the first, third and fifth red stripes and in the last white stripe. There is minor bleeding of the red dye into one star and there is very minor foxing and staining in limited areas throughout. 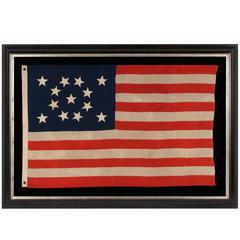 Overall condition is amazing for a silk flag of this period and the colors are exceptionally strong. Measures: Frame size (H x L): Approximate 36" x 48". Flag size (H x L): 24" x 35".